This post is part four of a seven part series featuring Columbus happy hours . Check back each week as Experience Columbus staff spotlight their favorite areas of Columbus to meet friends, share a drink and have some fun. In this post, Kelly explores the happy hour specials downtown. You can also check out options in the Short North Arts District , Grandview , or Park Street . Stay tuned for future posts in the series, where we&apos;ll feature the University District at OSU, Easton Town Center and Worthington. Downtown Columbus restaurants are known for many different things - some are trendy and upscale, while others are more laid back and casual. Whatever atmosphere you choose, you’re also sure to find great happy hour deals. 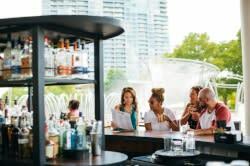 Whether it’s half-price drinks, specially priced bar menus or daily food specials, you can’t go wrong. One of my favorite happy hours is at Barrio Tapas Lounge, especially for their 2-for-1 Tapas Tuesdays. Every Tuesday tapas are buy-one-get-one-free, all day. Create a new combination each week and never get bored, or stick with your trusty favorites (I recommend the Fried Potatoes and Crab and Almond Empanadas). Pair your tapas with a half-price pitcher of sangria, and you’re in for a good night at a great price. Any downtown favorites that I missed? Let me know in the comments—I’d love to add them to my must-try list.